Psyche-med Dr. Ishtara comes to the conclusion she must ground Starbuck as unfit to fly. While Starbuck and a female Viper pilot are caught up in the middle of a dogfight with a swarm of Cylon Raiders, psyche-med Dr. Ishtara has come to the conclusion she must ground Starbuck as unfit to fly. Her intern argues in Starbuck's defense while we witness Starbuck more-or-less live up to Dr. Ishtara's psychoanalysis of him during the battle. Starbuck and his fellow pilot come through the Cylon skirmish alive and return to the Galactica. Starbuck arrives late for his psychoanalysis session and almost preternaturally compares his and the doctor's manners of coping with the situations they find themselves in. As the session is just beginning, an alarm claxon rings, calling all pilots to duty. Dr. Ishtara decides to clear him for duty as he races off. On page 2, we are introduced to a psyche-med intern named Vesta. Vesta is also the name of a v-world gamer in New Cap City on the Caprica TV series. 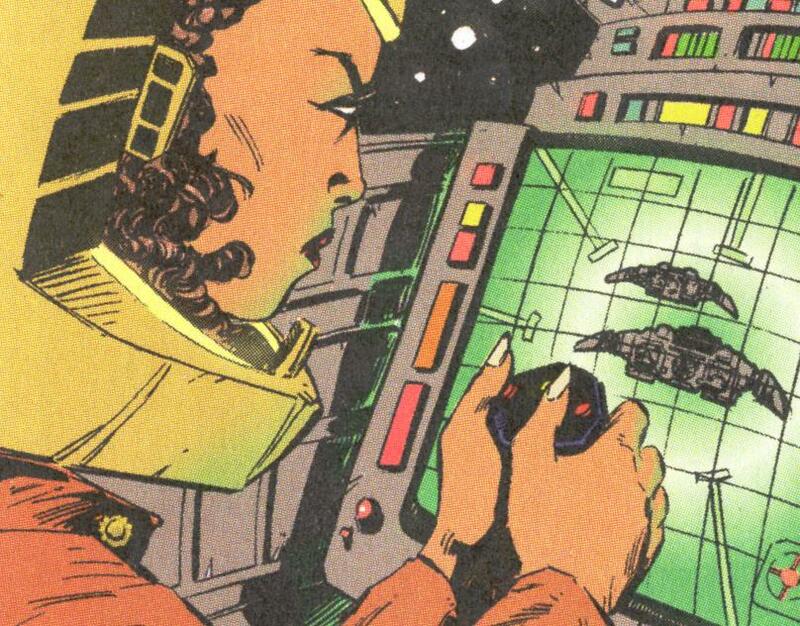 The cockpit of Red Three's Viper on page 3, panel 5 looks nothing like the cockpits we saw in the TV episodes! On page 4, Starbuck invites a female Viper pilot to share a thermo-tub. Presumably, a thermo-tub is similar to a hot tub in our world. Also on page 4, Vesta brings a stack of security cam videos to add to Dr. Ishtara's report tape. Really? A stack? Couldn't they all have been transferred to Ishtara digitally? And even if they were on physical media, they'd be on one small memory chip, not a chestful of plastic video tape boxes as seen here, at the Colonial level of technology. On page 6, Viper pilot Red Three describes herself and Starbuck as "sitting avions". This is obviously an analogy to the Earth term "sitting ducks" (from the Latin "avus" meaning "bird"). According to Armageddon, "avion" is the Borellian Nomen term for bird.